WHAT A LOVELY SURPRISE .. 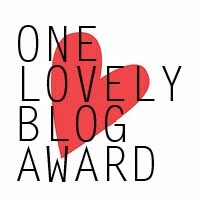 I am delighted to tell you all that I have been awarded the 'One Lovely Blog Award' by the bloggers from two ah-mazing blogs, http://bowtiedbeauty.blogspot.com/ and http://erika-t.blogspot.com/. Do take a look at them! 1. Thank the person that gave you the award and link back to them. 3. Nominate 15 other fabulous bloggers that you think deserve the award. 4. And of course let them know that they have been awarded this lovely award! 1. Fashion isn't my only passion, I'm also a singer/songwriter. 2. I'm a terrible liar. 4. My favourite designer brand is Louis Vuitton. 5. I love to get my nails done, especially a French Manicure. 6. I love to read Vogue. 7. I love both cats and dogs, I don't have a favourite. thanks so much for the Award! I love your Audrey Hair tutorial, her look never gets old; I love the idea of looking back when were 80 not being horrified of what we were wearing - She achieves it! And I totally agree, her style is timeless. I am very grateful! Thank you so much, I did not expect coming from a blog I often follow as I identify with your style. Really, thank you very much! congrats, all you have to do is write a post, nominating 15 other bloggers! Thanks so much Hanna for nominating me. I am nominating you. thank your very much hannah it was really lovely of you ;) i am going email you about how to except it as im not to clear.